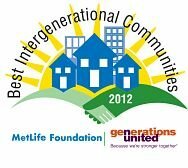 On March 1, 2012 it was announced that the City of Oberlin had been selected to receive one of the first MetLife Foundation Generations United Best Intergenerational Communities Award to heighten awareness of the importance intergenerational solidarity plays in building strong, supportive communities. According to Donna Butts, Executive Director, “The competition was stiff and it was difficult for our blue ribbon panel of judges to narrow the field to only five recipients.” The Oberlin “application rose to the top and we are very excited about honoring the wonderful work underway in your community.” In addition to the City of Oberlin, Generations United and MetLife Foundation are recognizing Georgetown, Texas; Lamoni, Iowa; San Diego County, California; and Virginia Planning District 10 with the award. And, of course the support letters in the application were particularly important. Special appreciation goes to Rachel Mentzer, David Sokoll, Scott Broadwell and John Elder for their letters and to many other residents who prepared letters for the application that, unfortunately, we could not include due to application limits.